Nobiskrug’s hull 782 was launched at its Rendsburg, Germany yard in October 2011. Based on the same philosophy as Siren and Sapphire, Mogambo has a length of 73.55 metres but her smoother lines were designed by Reymond Langton Design. The London based office is also responsible for the interior. Her general profile and original paint scheme make Mogambo one of the sleeker yachts launched in 2011. 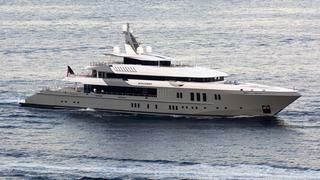 She can accommodate 12 guests, looked after by 17 crew. She’s named after a movie of the same name starring Clark Gable and Grace Kelly.